﻿ Hoi An Historic Hotel (Vietnam) | FROM $45 - SAVE ON AGODA! "Very easy to walk to the center of town." 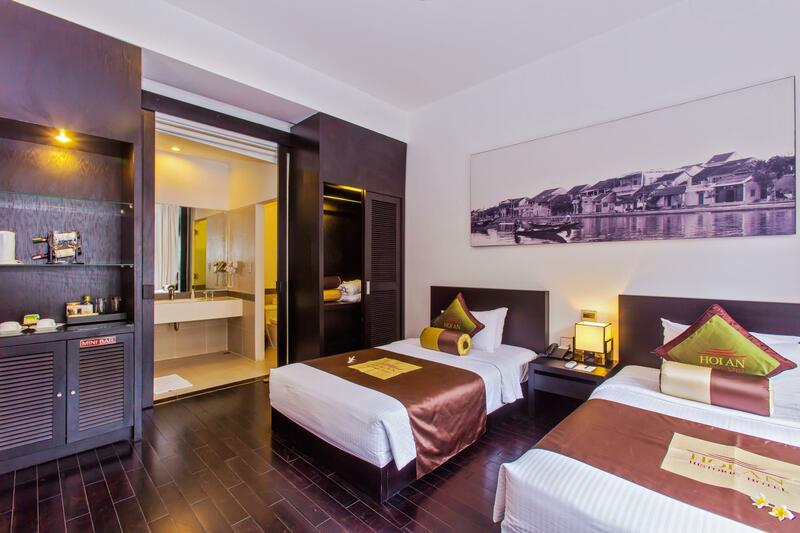 Have a question for Hoi An Historic Hotel? "Perfect location, friendly staff, value for money." "Feeling so good to stayed here im feel choose the right hote..."
Boasting 19th century colonial charm and modern amenities, business travelers and tourists will appreciate the convenience and atmosphere of this hotel. 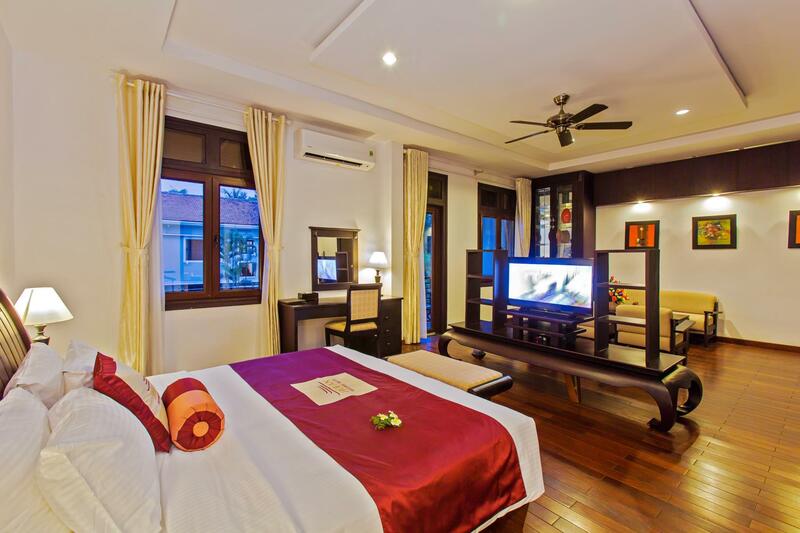 Located four kilometers from Cua Dai Beach, the Hoi An Historic Hotel is perfect for those in search of sun and sand. 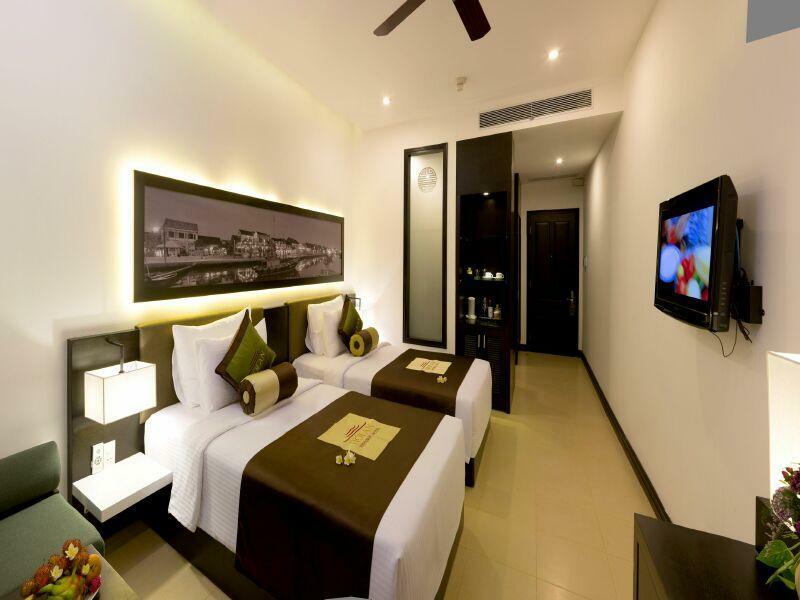 The rooms of this boutique hotel are beautifully decorated and include satellite television and mini bars. The restaurant serves the finest local cuisine while the newly refurbished bar mixes cocktails throughout the day. Suitable for business travelers as the conference rooms and business center are fully equipped with the latest technology. 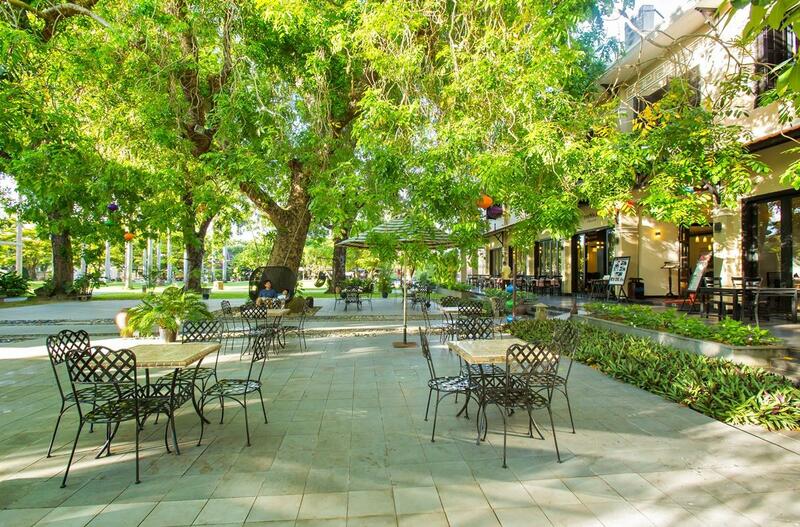 Car rental is available for visiting nearby locations like the Museum of Trade Ceramics and Bach Dang. 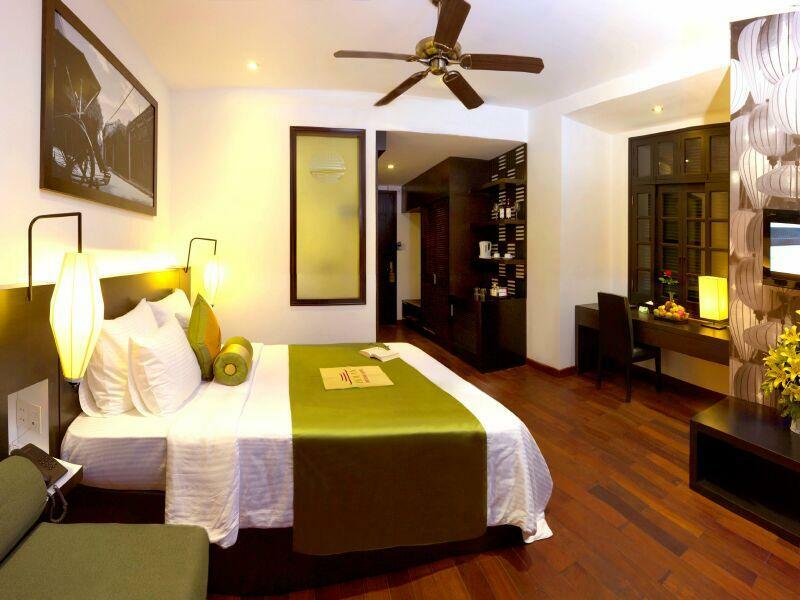 The tour desk, fitness center, and art gallery all add to the convenience of staying at the Hoi An Historic Hotel. "Perfect location cozy room and reasonable price"
One child under 6 years old stays for free if using existing bed and breakfast provided. One child age 6-11 years old will be charged a discount rate of USD 33 with extra bed and breakfast provided. 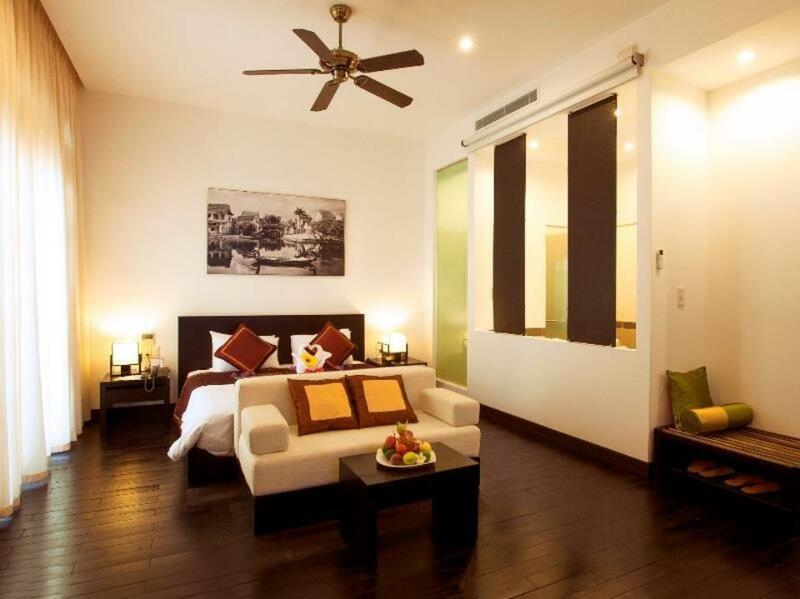 This hotel is perfectly situated for exploring Hoi An Ancient town. The pool area is large and inviting. Staff are very friendly and helpful. Breakfast is good but other food is not - don't order the pizza, it is very bad! Overall a great place to stay, highly recommended! 1. The cheaper rooms tend to be towards the street where it gets loud around early morning from the motorcycles. 2. Some Grand Deluxe Rooms are bigger than others. They face the pool side so tend to be quieter (except if Anglophone groups hang out at the pool that is, of course :-)) 3. I find it unacceptable that a hotel nowadays still charges for cappuccino or espresso with the breakfast (70,000 VND = $5!) - and to make it worse, it's not even good. Was the worst breakfast coffee on our trip - and the only one we had to pay. 4. In the two rooms we had, both showers were in bathtubs - not an issue for us but for elderly or otherwise with limitations in mobility may well be. Besides these, I find it good value for money, in walking distance to everything, still far enough away to escape the mayhem when you want and it has a big complex. Overall, everything was fine except for the check-in part. I was waiting at the reception desk to wait for the check-in and the staff took my ID and asked me to wait at the sofa area. Me, my husband and the 2 years old girl were sitting there for about 10 minutes while there was no guest at the reception desk with 2 staffs looking at their computer. I thought either of them would be processing my check-in. However, when a foreigner couple arrived at the reception (like 15 mins after us), the receptionist proceeded with the check-in for this couple instead of us. I had to voice up for them to realize we were waiting. (the lobby wasn't crowded at all). The location is great and other experience were good. We enjoyed our stay for 4 nights. The room was spacious and clean, the pool facilities were good, all the staff were friendly and helpful. The location is minutes away from the old town and markets. The only comment would be that the shower is over the bath and there is a step up and then down into a deep bath. This was not an issue for us, but might be for someone with mobility issues. You cannot beat this hotel for location and value. The ancient city is across the street. Makes it so nice. One watch out. The bath tub can be hard to get in and out of if you are short and clearly if you are elderly. You might want a shower room instead of a tub. I have been to Hoi An, four times and stayed at this hotel for 3 of those times. The location is perfect as it’s near the ancient town but quiet. Breakfast buffet is awesome and the staff are friendly and always helpful! We won a complimentary massage and while the White Lotus spa has a nice atmosphere the massage was very poor. That is the only negative of this hotel which overall has a wonderful ambience! The hotel is located at prime location, where we could easily walk down to the Night market, or to explore some local delicacies. However, it's still able to maintain its serenity as the hotel's room is separated from the main street by a big garden. Would definitely reccommend. 7세아들 한명과 갔어요~ 30분 무료스파이용권 받아서 머리마사지했는데~ 시원했어요 추천합니다^^ 그리고 일정상롯데마트배달을 직접받을 수가 없어서 카운터 직원분께 배달비+상품주문비용을 미리 드리고 대신 받아달라 했더니 잘 받아주셨어요^^ 자연친화적?인곳이라 공용화장실 및 복도등에 도마뱀이 있어요.. 그런데 사람을 헤치는것도 아니고... 아들은 한국에서 잘 볼수없는 도마뱀 찾아다니느라 이곳저곳 호텔 곳곳을 돌아다니는 재미를 느끼더군요..ㅋㅋ 도마뱀이 있는곳은 해충이 없다고(도마뱀이 잡아먹어서)그러던데.. 그래서 그런가... 객실내부에서 모기나..개미를 못봤어요.. 오히려 다낭시내 호텔에 개미가 있더라구요..
Second time I've stayed in this hotel, once before in 2010. Still very impressed with the facilities, room, breakfast, staff. Great location, almost right beside the beginning of the walking area on Le Loi Street. Definitely recommend! nice pool and beautiful garden. Its very close to the town and tailors. Rooms are spacious and clean. breakfast is nice and lots of choices for in hotel dining. It’s our choice for accomodate. The location is exceptional. The reception staff are ok. Poor English and unaccommodating. The property is vast so the personal touch is missing. Try not to get a room facing the street at the back of the hotel as there is a school across that road & every weekday morning drum band practice was conducted from early am to around 10am - not great for those on holiday! I thoroughly enjoyed my 3 nights at this hotel. It is ideally located, and the room was very comfortable and nicely furnished. It is quite hot this time of year (April) so a dip in the swimming pool was really welcome. For what I paid, it was very good value. I've stayed a number of times in a variety of hotels in Hoi An, and this is definitely my top choice. Great location - short walk into town. Rooms were excellent. Pool and gardens were clean, tidy and well maintained. Breakfast was good. Spa was relatively expensive for what you can get around town. Didn't end up using the shuttle service or bikes but was nice to have the option. The location is very convenient and the hotel grounds, pool, and rooms are very pleasant. That said there were some quite noisy events during our stay, and the school out the back can certainly be noisy albiet briefly morning and afternoon. Don't use the hotel laundry, it is about 10 times the price of laundries over the road. The room service meal we had was quite nice, but I would only rate the breakfast as average at best. The hotel offer superb breakfast buffet, great restaurant with quality food, very close to the ancient town, with greenery landscape. Staff are friendly and helpful. Everything was great. I recommend this hotel and I will stay again next trip. This is a lovely historic hotel close to the ancient town. Great pool. Some staff a bit ordinary but some were lovely. Reception staff were very helpful. Cooking lesson was great. I would definitely stay here again.